1686: his father (adoptive father? master?) Sodeoka Masanosuke I dies. 11th lunar month of 1686: he takes the name of Sodeoka Masanosuke II and performs as a wakaonnagata in Ôsaka at Araki Yojibê I's theater. His yearly salary is 35 ryô; his stage partners are Yamashita Hanzaemon I, Iwai Hanshirô I, Yamamura Kanzaburô, Sakurayama Rinnosuke I, Sakata Tôkurô, Takenaka Hanzaburô, Matsushima Han'ya II, Kozakura Kodayû, Takigawa Kiyosaburô, Yoshikawa Genzaburô, Mihara Jûdayû I, Wakabayashi Shiroemon and Sadoshima Denpachi. 1691: Masanosuke settles in Edo, where he becomes wakaonnagata. 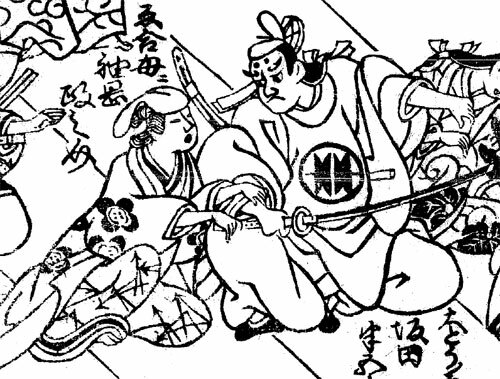 11th lunar month of 1696: Masanosuke plays at the Nakamuraza in the drama "Neko no Koneko", commonly called "Onna Narukami"; his stage partners are Ichikawa Danjûrô I, Ogino Sawanojô, Nakamura Shichisaburô I, Nakamura Denkurô I, Nakajima Kanzaemon I and Ôtani Hiroemon I. 11th lunar month of 1698: Masanosuke becomes kashagata and performs at the Yamamuraza in the kaomise drama "Genji Daikoku Bashira". 3rd lunar month of 1699: Masanosuke's rank in the Edo hyôbanki, kashagata section, is jô-jô-kichi (superior - superior - excellent). 6th lunar month of 1699: Masanosuke becomes wakaonnagata and plays at the Yamamuraza the role of Yamashina Hayato's wife in the drama "Isshin Onna Narukami"; the role of Yamashina Hayato is played by Suzuki Heizaemon I. 11th lunar month of 1699: Masanosuke plays at the Yamamuraza the role of Otokonosuke's wife in the kaomise drama "Kantô Koroku Kokyô no Nishikie". 3rd lunar month of 1700: Masanosuke's rank in the Edo hyôbanki, wakaonnagata section, is jô-jô (superior - superior). 1701~1711: a 10-year gap in Masanosuke history. One possible theory is that he went back to Kamigata. 11th lunar month of 1711: Masanosuke becomes kashagata and performs at the Yamamuraza in the kaomise drama "Shida Konjiki no Uroko". 3rd lunar month of 1712: Masanosuke's rank in the Edo hyôbanki, kashagata section, is jô-jô (superior - superior). 11th lunar month of 1713: Masanosuke performs at the Yamamuraza in the kaomise drama "Sazare Ishi Nasu no Futahashira". 2nd lunar month of 1714: Masanosuke's rank in the Edo hyôbanki, kashagata section, is jô-jô-(shiro)kichi (superior - superior - (white) excellent). 11th lunar month of 1714: Masanosuke performs at the Nakamuraza in the kaomise drama "Banmin Daifukuchô". 1st lunar month of 1715: Masanosuke's rank in the Edo hyôbanki, kashagata section, is jô-jô-kichi (superior - superior - excellent). 11th lunar month of 1715: Masanosuke performs at the Nakamuraza in the kaomise drama "Kogane no Kaburi Konrei Yorimasa". 11th day of the 1st lunar month of 1716: a fire breaks out in the district of Shitaya Ike-no-Hata and spreads to others sections of Edo, destroying both the Ichimuraza and the Nakamuraza. Masanosuke has to take some unintended vacation during the rebuilding of the theater. 11th lunar month of 1716: Masanosuke performs at the Nakamuraza in the kaomise drama "Mitsudomoe Katoku Biraki", which celebrates the shûmei of Arashi Kiyosaburô II. 11th lunar month of 1717: Masanosuke plays at the Ichimuraza the role of the tsubone Shirakawa in the kaomise drama "Kinkazan Yoroi Biraki". 11th lunar month of 1718: Masanosuke plays at the Ichimuraza the role of Tsuneyo's mother in the kaomise drama "Gozen Nô Mitsu Uroko", which celebrates the arrival in Edo of the Kamigata actor Onoe Samon; Masanosuke's others main stage partners are Mimasuya Sukejûrô I (he plays the role of Sano Genzaemon Tsuneyo), Ogawa Zengorô I, Sanjô Kantarô II, Ôtani Hiroji I, Ichimura Takenojô IV, Ôkuma Utaemon, Nakajima Mihoemon I and Onogawa Orie. 11th lunar month of 1719: Masanosuke performs at the Moritaza in the kaomise drama "Banmin Taiheiki". 1st lunar month of 1720: Masanosuke plays in the same theater the role of the mother of the Soga brothers in the new year sogamono "Yuzuriha Kongen Soga", which commemorates the 16th anniversary (17th memorial service) of the passing away of Ichikawa Danjûrô I. 11th lunar month of 1720: Masanosuke plays at the Moritaza the role of Watanabe's mother in the kaomise drama "Kaigô Sakiwake Shitennô"; the role of Watanabe no Taketsuna is played by Ichikawa Danjûrô II. 1st lunar month of 1721: Masanosuke plays in the same theater the role of the mother of the Soga brothers in the new year sogamono "Nigiwai Suehiro Soga"; the roles of Soga Gorô Tokimune and Soga Jûrô Sukenari are played by Mimasuya Sukejûrô I and Ichikawa Danjûrô II. 11th lunar month of 1721: Masanosuke performs at the Moritaza in the kaomise drama "Semimaru Yôrô no Taki". 11th lunar month of 1722: Masanosuke performs at the Nakamuraza in the kaomise drama "Hônen Taiheiki". 1st lunar month of 1723: Masanosuke appears on stage for the last time, at the Nakamuraza, where he plays the role of mother of the Soga brothers in the new year drama "Soga Koyomi Biraki"; the roles of Soga Gorô Tokimune and Soga Jûrô Sukenari are played by Mimasuya Sukejûrô I and Ichikawa Danjûrô II. Masanosuke falls ill afterwards and has to retire from the Kabuki stages. 15th day of the 9th lunar month of 1724: Masanosuke dies in Edo. Sodeoka Masanosuke II was born and trained in Kamigata but achieved fame for himself in Edo, as it was often the case for onnagata actors at the beginning of the 18th century. He was active in Edo 4 theaters from the beginning of the 1690s to 1700, then from the beginning of the 1710s to the beginning of the 1720s. He was considered as the first important Edo kashagata, continuously holding the prestigious jô-jô-kichi rank from 1715 to 1723. He excelled in a wide range of roles, like kôshitsu, tsubone or the mother of the Soga brothers.